WRENTHAM, Mass. – King Philip came into Friday’s game on a high after scoring 73 points and winning by 42 on Tuesday, but the shots that all seemed to go in against Stoughton mostly stayed out against Mansfield. The Hornets, on the other hand, were on fire. They knocked down six three-pointers through three quarters and built their lead to as many as 21 at one point in the third. 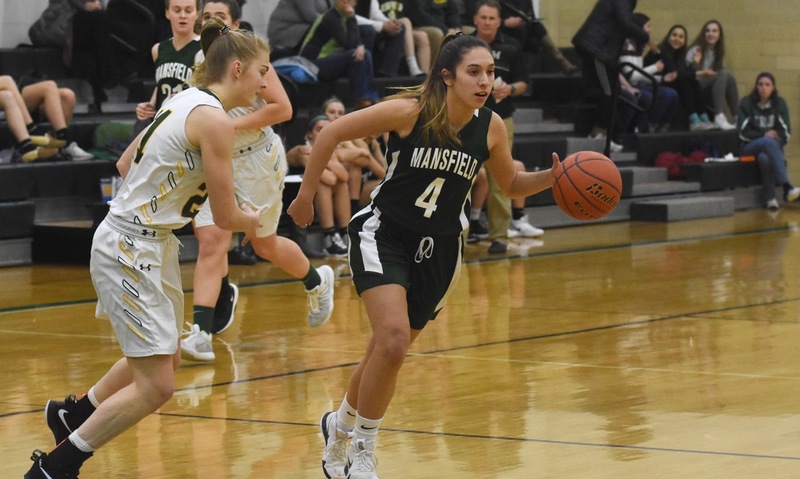 Mansfield rode that quick start to a 53-44 victory that keeps the Hornets two games back of league-leading Franklin and alone in second place in the Kelley-Rex division. Sydney Mulkern was the spark for the Hornets on Friday, scoring a game-high 20 points, including 14 in the first half. She got off to a quick start, knocking down a three and driving to the basket for a quick 5-0 lead. Mulkern scored on the break, following a pinpoint pass by Becca Hottleman, and added a layup in traffic off an inbounds pass by Kara Bendanillo (four assists). 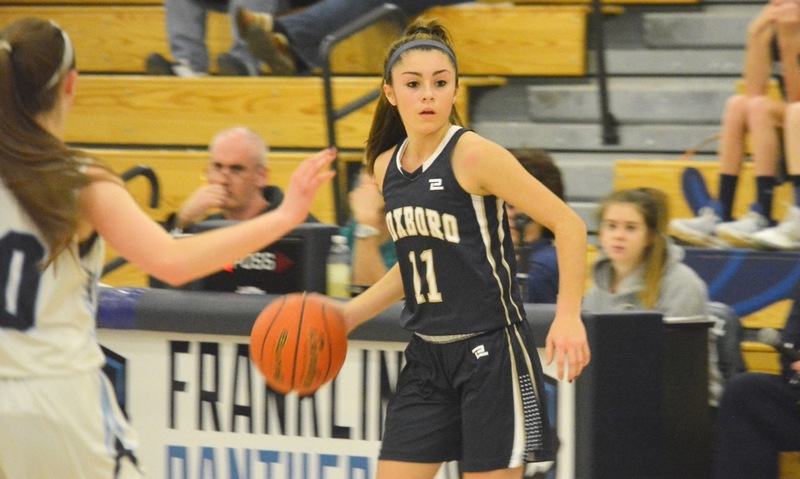 KP’s offense struggled to get into any rhythm and wasn’t helped by first quarter foul trouble for top scorers Faye Veilleux and Shannon O’Connor. O’Connor scored four points in the first and assisted on an Emma Glaser basket that cut the Mansfield lead to two, but the Hornets got four quick points to lead by six after one. Mulkern kept the hot shooting started with a three in the second and then Emily Vigeant added a pair of threes before halftime as well. In between, Maggie Danehy got started on the offensive end by crashing the boards and getting five points in the quarter. KP tried to hang around by getting a spark off its bench, with sophomores Caroline Aaron (eight points) and Glaser contributing. Mansfield led by 15 points at the break and looked to put the game away in the third. Danehy hit a couple of jumpers and Mady Bendanillo scored on a put-back. Mulkern added two more threes and the Hornets pulled away to take a 44-23 lead. KP tried to climb back into the game and make things interesting down the stretch. The Warriors went on an 8-0 run to close out the third with O’Connor hitting a pull-up jumper, Aaron getting to the basket, and Veilleux finally able to get some touches around the basket. The momentum the Warriors gained during that stretch couldn’t carry over to the fourth because they just couldn’t find the range from the outside. Veilleux hit a jumper off a Faith Roy assist and O’Connor hit a mid-range shot on an inbounds pass from Kendall Mason, but KP wasn’t able to significantly cut into the Mansfield lead. After knocking down six three-pointers on Tuesday night, Julia Leroux made KP’s first three of the night with the game’s final shot and got the Warriors as close as they had been since the second quarter. The Hornets continue to hang around in the league title race, trailing Franklin by two games with one head-to-head meeting left on the schedule. Mansfield (7-3, 6-2) will stay on the road on Tuesday night with a trip to Stoughton, while King Philip (6-3, 5-3) will head to North Attleboro to face the streaking Rocketeers. MANSFIELD, Mass. 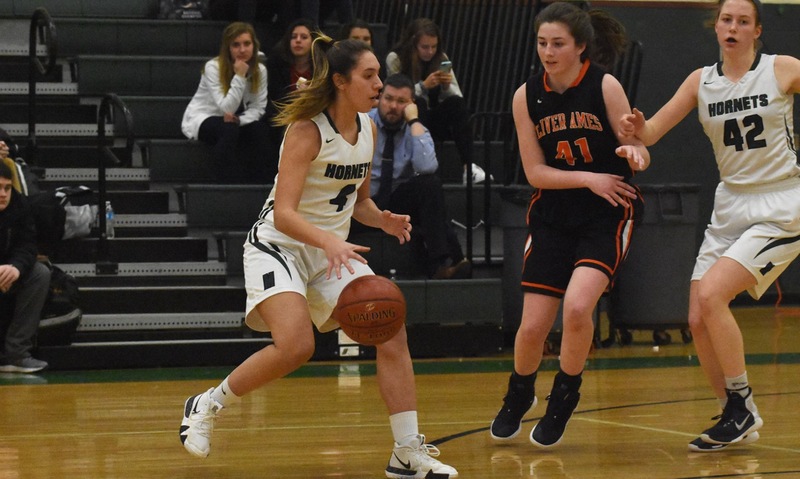 – Coming into Friday night’s game against Oliver Ames in the Albertini Gym, Mansfield coach Mike Redding wasn’t sure what he would be able to get from senior guard Sydney Mulkern, who had been sick at practice the day before. As it turns out, the Hornets got plenty from Mulkern. She came off the bench and scored a game-high 17 points, including 13 in the second half and eight in the fourth quarter, to provide the offensive punch in an otherwise defensive struggle with the Tigers, helping the Hornets pull out a 41-32 win. Neither team was really able to find a rhythm on the offensive side of the court. The game was tied at 2-2 five minutes into the opening quarter. Maggie Danehy (13 rebounds) scored her only bucket on an offensive rebound to put the Hornets in front, but freshman Caroline Peper (nine points) answered with a three. Ashley Santos scored back-to-back baskets, but Ally Scolnick knocked down a three to tie it 8-8. Caroline Flynn also grabbed 10 rebounds in the first alone and finished with 20 boards for the Tigers. Mulkern’s first points gave Mansfield a 10-8 lead after one, a lead that it would never relinquish. The second quarter was even more difficult for both offenses. Mady Bendanillo (eight points and seven rebounds) scored to make it 12-8 but neither team would score again until there was 2:10 left in the quarter when freshman Hailey Bourne got her lone basket of the night for OA. Mulkern hit a layup and Megan MacVicar scored off a Bendanillo assist to make it 18-12 at the break. Mansfield came out in the second half and started to pull away, leading by as many as 12 points at one point. Mulkern started the third with a deep three off a pass from Kara Bendanillo (six steals and three assists). Peper cut the lead to 23-16, but Mady Bendanillo hit a huge three-pointer at the shot clock buzzer to put the Hornets up double digits and her sister followed with a layup in transition for a 28-16 lead. OA continued to find points tough to come by, but the Tigers made a little run to cut the Hornets lead to just five. 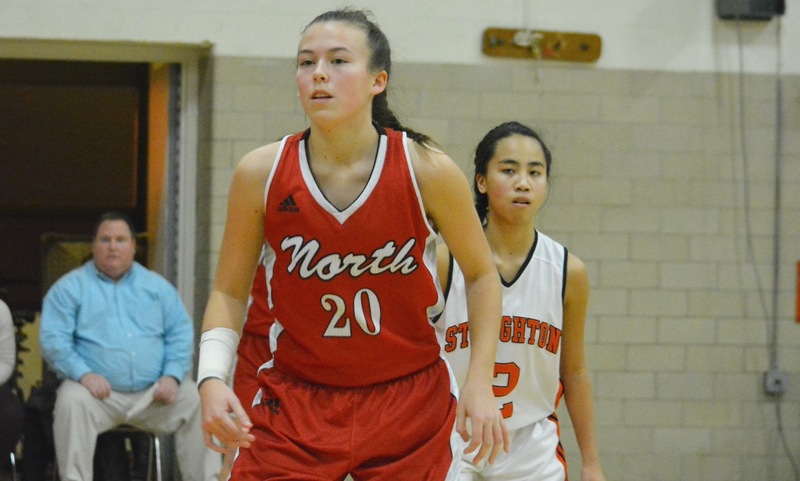 Sadie Homer got a steal and transition layup and twice Meg Holleran was able to find Scolnick (team-high 13 points) on consecutive backdoor cuts. Kara Bendanillo got out in transition to close the third with a layup and give the Hornets a seven-point edge heading to the fourth. Scolnick opened the fourth with a jumper to keep it close but then Mulkern broke the game wide open. She sandwiched a Becca Hottleman steal and layup with a pair of threes (one after Kara Bendanillo kept a possession alive with an offensive rebound) to extend the lead back to 11. OA kept the game on edge to the final whistle by causing havoc with a press, raising the energy of the team but not getting the Tigers any closer than eight points. Redding admitted that this was an important win for the Hornets, despite it still being early in the season. The Hornets, who are seeking a program-record fourth straight league title, trail division-leading Franklin by two games and are now tied with the Tigers for second in the Kelley-Rex. Mansfield (5-3, 4-2) will face a tough test on Tuesday night with the visit of Canton, which has won five games in a row, while Oliver Ames (5-3, 4-2) will try to get back on track at home against Sharon before facing Franklin for the first time.